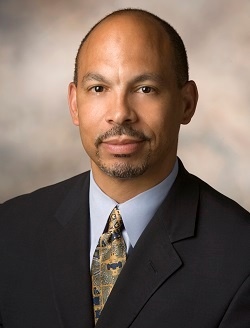 As a board member of the American Hospital Association and chair of its Equity of Care Committee, Eugene Woods has an opportunity to see up close how health disparities affect far too many people in the U.S.
“We know beyond a shadow of a doubt that significant inequities exist,” he says, noting a recent study by the Institute for Diversity in Management that indicates only 22 percent of hospitals have utilized data to identify disparities in treatment and/or outcomes between racial or ethnic groups by analyzing one or more of the following: clinical quality indicators, readmissions or CMS core measures. While this is an increase from 20% in 2011, Woods says he wants to see more results from the industry. Woods, who also serves as executive vice president and chief operating officer for the 33-hospital Christus Health system, comes at the issue of diversity from an interesting angle. His worldview was partially formed through his early years growing up in his mother’s hometown in Spain. His own family today reflects those beliefs, he says. Woods came to Christus after a number of years in Lexington, Ky., where he was CEO of St. Joseph Health System while also serving as Senior Vice President of the Catholic Health Initiatives system. One of the things that drew him to Christus, he says, was the commitment to diversity of CEO Ernie Sadau. In three years, he says, the percentage of diverse leaders at Christus has grown from 10 to 25 percent. Woods played a key role in launching Christus’ inaugural two-year minority fellowship program as well as its executive-in-residence diversity program. Along with growth and clinical integration, diversity is one of three key strategic priorities at Christus. Personally, Woods says ministry is top of mind for him as he navigates his successful career in healthcare. It’s one of the reasons he made the jump from one faith-based system to another. A sense of mission also was impressed upon Woods back in 2001 as well. When the 9/11 attacks happened, he had only been on the job for a few days overseeing operations for the Washington Hospital Center. People wounded in the Pentagon attack were brought to the hospital, and Woods remembers many heroes from those days, including two material management workers who drove non-stop from the nation’s capital to San Antonio and back – because all U.S. airports were closed – to pick up supplies needed to treat burn victims. On the AHA’s Equity of Care Committee, Woods says he has had the opportunity to watch a number of healthcare providers create a high bar for standards of care when it comes to eliminating disparities. He ticks off a list of outstanding hospitals – Massachusetts General in Boston; University Hospitals in Cleveland, Ohio; Henry Ford Health System in Detroit; Lutheran HealthCare in Brooklyn, N.Y.; and Kaiser Permanente in Oakland, Calif.
“These systems are doing some incredible things around diversity with great outcomes and are leading the field with best practices,” he says. He’s hopeful that these hospital’s examples can be a rallying cry for the industry – and a turning point.